CactusVPN is a first-class VPN service provider founded in Moldova in 2011. It started as a small company, owned by a group of friends, and grew enormously over the years. Nowadays, it operates servers all over the world, providing their customers top-notch VPN service for safe and anonymous Internet browsing. Read this detailed CactusVPN review to find out more about this company and its services. CactusVPN is dedicated to allowing its users to use the Internet freely and anonymously. In order to achieve that, the company offers a wide range of online protection features, ranging from different VPN protocols and proxy servers to a strict no logs policy. The best part? You can use this VPN even if you’re not tech-savvy! Once you have installed the CactusVPN application on your computer or phone, you get to choose how to protect yourself. The client is very modern, sleek and, most importantly, easy to use. You can choose the protocol and server you want to use, as well as whether you actually want to keep logs. The interface is a perfect match of simplicity and endless possibilities. If you’re not a tech-savvy person and want the application to do everything for you, you’re in luck – CactusVPN can do just that! But if you like to play with options or combine different VPN protocols and proxy servers, you can do it too! The number of servers isn’t CactusVPN’s biggest advantage, but what they offer should be enough for most VPN users. There are 20 VPN servers located in 9 countries: the US, the UK, the Netherlands, Romania, Germany, Canada, Australia, South Korea, and France. Note that P2P is only allowed on servers in Germany, Romania, and the Netherlands. Like with all VPNs, your Internet connection may suffer a bit when you use CactusVPN. However, the drop in speed is minimal and shouldn’t interfere with your online activities. The company looks to solve this problem with its Smart DNS service, though. CactusVPN provides unlimited bandwidth, so you can rest assured that you won’t be charged any extra money no matter how many files you download or upload. In order to provide you with top-of-the-line VPN service, CactusVPN is supported on all major platforms. CactusVPN works on Windows, Mac, Android, iOS, Ubuntu, and even on some routers and Boxee Box. You can use CactusVPN on various devices, as long as their operating systems are compatible with the VPN. You get to use up to 3 devices simultaneously, but they can’t be connected to the same server. In order to enable you to surf the Internet smoothly, safely, and anonymously, CactusVPN provides SSTP, PPTP, L2TP/IPSec, OpenVPN, and SoftEther VPN protocols. You can choose which protocol you want to use during a certain online session and you can switch between them without restrictions. All of them are available for all subscribers at any time. Note that you’ll have to perform a manual setup in order to gain access to SoftEther. The manuals are provided on the official website. CactusVPN offers unlimited server switching. You can easily change the server you are using by changing the city or country where the server is located. This is important because different website versions are presented in different countries – with CactusVPN, you get to open whichever version of the website you want. CactusVPN always shows you which server is the fastest at the moment, so you can connect to it and enjoy greater speed. Your speed and bandwidth are unlimited with CactusVPN, but your connection can slow down at some point, especially if a lot of people use one server at the same time. In addition to these excellent features, CactusVPN has some extra options for their users. For example, there’s DNS and IP leak protection for added safety and protection from hackers or cyber criminals. 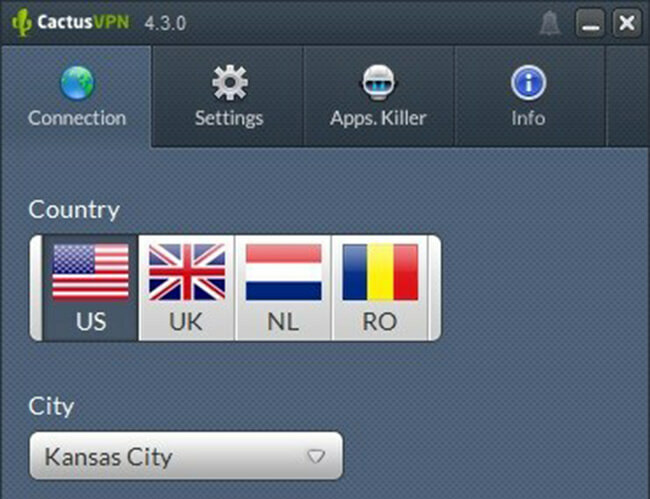 CactusVPN provides a kill switch that enables you to choose which apps and programs should be turned off first if your VPN stops working properly. As we already mentioned, CactusVPN supports 6 different encryption protocols including the most secure of them all, OpenVPN, which we sincerely recommend. The company uses AES-128 cipher with RSA-2048 handshake and SHA-1 HMAC authentication. It also implements perfect forward secrecy to distribute new keys for each connection. CactusVPN doesn’t keep any logs regarding your IPs, DNS requests, online traffic, connection, and bandwidth. In other words, the company doesn’t store any data that can lead back to you or identify you as an individual. CactusVPN also offers a variety of free proxy servers, which can additionally improve your experience. Smart DNS proxy keeps you safe and anonymous and DNS leak protection makes sure your information is impossible to access. We were previously informed about the 24/7 live chat offered by CactusVPN. This, however, is not the reality since the mentioned live chat operates Monday through Friday 9:00 – 18:00 CET. If you’re not a fan of live chat, you can also check out the FAQ section, which is very informative, just as the website itself. In case you don’t find the information you need, you can also submit a ticket and receive a reply via email. Your subscription can be paid with any major credit card, as well as via BitCoin, PayPal, Qiwi, Webmoney, Boleto Bancario, Yandex Money or Alipay. As we wrap up this CactusVPN review, here’s a quick overview of the features that wowed us and the aspects of the service that could use some improvement. Our ratings are the result of an objective and independent evaluation of CactusVPN, generating the final rating that reflects the overall quality of the company. Ratings may change as the service changes. CactusVPN user rating based on 4 user reviews. We found 2 verified CactusVPN discounts for April, 2019. Get 3 months of Cactus VPN for only $12.59! Get 1 year of Cactus VPN for only $38.49! Sign up and we’ll let you know about future CactusVPN promo codes. Discover the full range of possibilities CactusVPN offers and become an advanced user in no time with our beginner-friendly CactusVPN guides. Whether you are interested in secure torrenting, unblocking Netflix, setting up CactusVPN on all your devices or you simply want to learn more about CactusVPN, you can find verified information and clear instructions in our CactusVPN guides below. Does CactusVPN Work With Netflix? - including all the relevant details about CactusVPN’s past and current ability to unblock US Netflix.